Gorgeous 2 level 2 bed light filled townhouse in the heart of Heights! South facing fantastic bright open plan totally with the best city and mountain views. 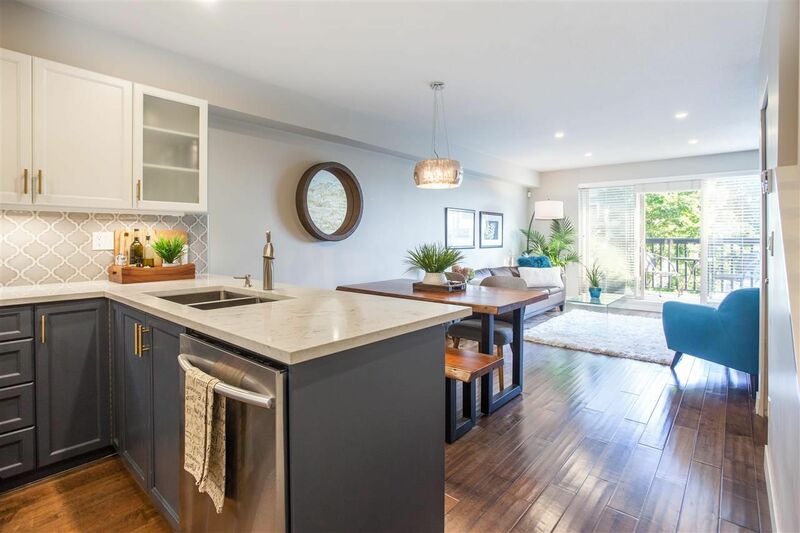 Great layout on the main w' spacious chef's kitchen w' stunning quartz counters, ss appliances, custom lighting and eating nook. Dining and living has custom stone fireplace with built in's, faces a lovely south facing deck perfect for entertaining. Up, 2 generous bedrooms up with built in closet organizers, 2 stunning brand new baths- master with stand up shower, marble floors, seemless glass doors. 3rd level has an incredible rooftop deck with 270 deg views to enjoy fireworks & amazing sunsets over Vancouver's skyline! 1 parking, storage, pets welcome & restricted rentals. Steps to shops, restaurants, transit, school & parks. Do not miss out!! Open Thurs Sept. 21 6:30-7:30pm, Sat 2:30-4:30, Sunday 12-1:30.